The event was held in observance of the International Day of the Family (15 May). The annual observance reflects on the importance of families as the basic units of all societies and promotes awareness of issues related to families. The briefing looked at the important role of fathers in the family and the impact they have on future generations. The speakers included Mrs. Joyce C. Kafanabo, Minister, Permanent Mission of the United Republic of Tanzania to the United Nations; Ms. Nurper Ulkuer, Senior Adviser and Chief, Early Childhood Development Unit, UNICEF; Prof. Anderson J. Franklin, Department of Counseling, Developmental and Educational Psychology, Boston College. The briefing began with the screening of a film entitled, “To be a Father”, hosted by Ray Romano. Mrs. Joyce C. Kafanabo began by emphasizing the importance of the extended family in African culture. She went on to discuss the important role fathers play during the socialization process of children. Studies have shown that the more involved both parents were in their children’s lives, the better the children developed. Mrs. Kafanabo also spoke about the importance of fathers being present during childhood as well as during the child’s birth. She stated that roles of both mothers and fathers were changing. Traditionally, fathers have been viewed as the head of the family, the providers, and the decision makers, which often lead to gender inequality. Consequently, children identify mothers and women as caregivers, and associate fathers and men with authority and power. Mrs. Kafanabo suggested that mothers not use threats such as “If you do that, I will tell your father”. She furthermore noted that due to the culture and traditions, fathers in Africa were denied certain parenting opportunities. There are more than 120 different tribes in Tanzania, all with distinct traditions, and to achieve anything, one must be sensitive to the traditions. Mrs. Kafanabo concluded by saying that while men may be willing to change, the society was not ready; fathers play a unique role, but they need a support system. Ms. Nurper Ulkuer spoke about the work her organization was doing with regards to the role of the fathers from before the child was born until he or she entered primary education. She cited that scientific evidence showed that the role of fathers as parents and co-parents made a difference in child development and socialization. Ms. Ulkuer discussed gender socialization and the different messages received by boys and girls. The concept of masculinity had to change. Providing men with basic child-care knowledge and skills increased their self-esteem. Ms. Ulkuer suggested that a father’s participation and spending quality time with his child will promote gender socialization, gender equality, power balances, and “positive masculinity.” She furthermore elaborated on the concept of “positive masculinity” by noting that masculinity required men to act according to the traditional concept of ‘masculine’. She added that “positive masculinity” showed the more humane side of a male, including showing affection and caring for his child. Ms. Ulkuer concluded by saying that in order for fathers to be able to get more involved in their children’s lives, there was a need for societies to create policies that supported such change. Prof. Anderson J. Franklin started by saying that fathers were often overshadowed by the significant contribution of mothers. He said that to better understand fathers and families, we must consider men’s model of manhood. The masculinity ideology perceives how men think and act during fatherhood. Prof. Franklin stressed the importance of concentrating on the needs of men that are often ignored. He elaborated by citing the example of disaster relief, in which rescue teams focus on rescuing women and children, and often excluded men as part of the family. Prof. Franklin also mentioned that many men were caught up in the institution of community and society, and not the institution of family. He cited absent fathers to be an epidemic in some parts of the world and concluded by saying that children were impacted by the mother/father relationship in the family. Many children may grow up with a devalued opinion of this relationship due to absent fathers. During the question-and-answer period, a question was asked about how to maintain sensitivity to different cultures with regard to fatherhood. All three speakers were unanimous in their responses by noting the importance of understanding the community and its traditions. It was necessary to find a person within the community to communicate for you. Cultural brokers needed to be identified to translate the messages and make them more understandable to the community. Often, foreigners are mistrusted, and it was important to find an entry point to gain trust. In order to understand the current practices within a community, careful observation of the interactions among family members was important. It is important not to come with a “white man attitude” and try to change things when the people are happy with their situation. A comment was made that to encourage men to stay at home with their children, the issue of women’s wages in the workplace needed to be examined. 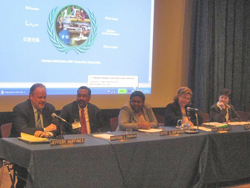 The briefing was attended by about 180 representatives of NGOs, United Nations and Permanent Mission staff.